The Simmons Beautysleep Queen Size Smartaire Express Air Bed With Hands Free Pump is ideal as an extra guest bed air mattress. The comfort top coil beaming provides maximum comfort. The plush waterproof velveteen reinforced top and the one touch adjustable comfort patented valve provides even more added comfort. The hands-free electric express pump inflates/deflates mattress quickly and includes a bonus adapter for use with all household inflatable's. It is puncture resistant and heavy duty, which supports up to 650 pounds. It also fits standard sized sheets. For convenient storage, use the included sturdy nylon duffel bag for compact storage. o Contours and supports your body for plush all night comfort. Velveteen cover ensures you bedding stays in place. Dimensions: 60" x 80" x 9"
The Simmons Beautysleep Queen Size Smartaire Express Air Bed With Hands Free Pump has many exciting features for users of all types. See the Simmons Beautysleep Queen Size Smartaire Express Air Bed With Hands Free Pump gallery images above for more product views. 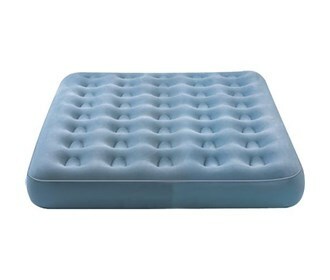 The Simmons Beautysleep Queen Size Smartaire Express Air Bed With Hands Free Pump is sold as a Brand New Unopened Item.